Niflumic acid is an inhibitor of cyclooxygenase-2 used for joint and muscular pain. Tiagabine is an anti-convulsive medication and a selective gamma-aminobutyric acid (GABA) reuptake inhibitor. Nefiracetam is a GABAergic, cholinergic, and monoaminergic neuronal system enhancer for Ro 5-4864-induced convulsions. Phase 2. Imidazole-4(5)-acetic Acid Hydrochloride is a competitive antagonist at GABAC receptors. Securinine, a major natural alkaloid product from the root of the plant Securinega suffruticosa, acts as a γ-amino butyric acid (GABA) receptor antagonist. Pimpinellin is a furocoumarin that acts as antagonist of proteins with GABA receptor activity. Songorine, a ubiquitous alkaloid in the genus Aconitum, is a novel antagonist of the GABAA receptor in rat brain and has antiarrhythmic, antinociceptive, anti-inflammatory, regenerative and CNS-modulating properties. Thiocolchicoside is a natural occuring glycoside originated from the flower seeds of superba gloriosa with anti-inflammatory and analgesic properties as well as pronounced convulsant activity. 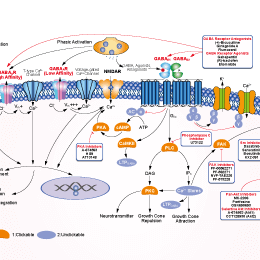 It is also an antagonist of GABAA receptor. (+)-Bicuculline is a competitive antagonist of GABAA receptors with IC50 of 2 μM, also blocks Ca(2+)-activated potassium channels. Effects of antagonists on the anti-hyperalgesic effects of sinomenine in CCI rats. * P<0.05 as compared to vehicle control group (N=8 per group). The GABAA receptor antagonist bicuculline but not the opioid receptor antagonist naltrexone nor the 5-HT1A receptor antagonist WAY100635 blocked the antinociceptive effects of 40 mg/kg sinomenine. Ginkgolide A is an extract from in Ginkgo biloba and a g-aminobutyric acid (GABA) antagonist with a Ki of 14.5 μM. Pentylenetetrazol displays activity as a central nervous system and respiratory stimulant. It is considered a non-competitive GABA(A) receptor antagonist. Bemegride is a central nervous system stimulant and antidote for barbiturate poisoning. Gabapentin HCl is a GABA analogue, used to treat seizures and neuropathic pain. Etomidate is a GABAA receptor agonist, used as a short-acting anaesthetic agent or sedative. Gabapentin is a GABA analogue, used to treat seizures and neuropathic pain. Isonipecotic acid is a heterocyclic compound that mainly acts as a GABAA receptor partial agonist. Baclofen is a gamma-amino-butyric acid (GABA) derivative used as a skeletal muscle relaxant and central nervous system depressant. It activates GABA receptors, specifically the GABAB receptors. Phenibut, a GABA analogue, is a central nervous system depressant with anxiolytic and sedative effects. (R)-baclofen is a derivative of gamma-aminobutyric acid primarily used to treat spasticity. Piperazine, GABA receptor agonist, is an anthelmintic used in the treatment of the intestinal nematodes Ascaris lumbricoides and Enterobius vermicularis. 6-Hydroxyflavone, a naturally occurring flavonoid, binds to GABAA receptors with moderate affinity and acts as a partial agonist of GABAA receptors. Baicalin is a known prolyl endopeptidase inhibitor and affects the GABA receptors. Afloqualone (AFQ) is a quinazolinone family GABAergic drug with muscle-relaxant and sedative effects, showing the agonist activity at the β subtype of the GABAa receptor. Oxiracetam, a cyclic derivative of gamma-aminobutyric acid (GABA), is used as a nootropic drug to improve memory and learning. Gamma-Aminobutyric Acid is a naturally occurring neurotransmitter with central nervous system (CNS) inhibitory activity. Acamprosate, calcium acetylhomotaurinate, is a synthetic compound with a chemical structure similar to the amino acid neurotransmitter gamma-aminobutyric acid (GABA) and the amino acid neuromodulator taurine. Allopregnanolone, a neurosteroid synthesized from progesterone in brain, acts as a highly potent positive allosteric modulator of the GABAA receptor. Homotaurine is a synthetic organic compound that has GABAergic activity by mimicking GABA. It is a GABAA partial agonist as well as a GABAB receptor partial agonist with low efficacy.